This page provides a summary of the deployments at the three Ocean Reference Stations maintained by Drs. Robert Weller and Al Plueddemann and the Upper Ocean Process Group of the Woods Hole Oceanographic Institution with support from the NOAA Climate Program. The three ORS are: Stratus, NTAS, and WHOTS. Stratus was first deployed in October 2000. NTAS was first deployed in March, 2001. 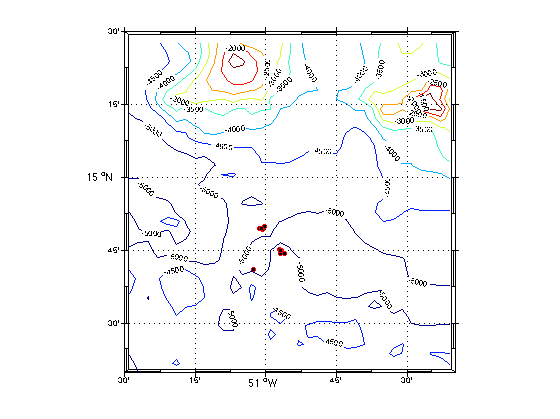 WHOTS, which is done in partnership with colleagues at the University of Hawaii, who are supported by the NSF, was first deployed in August, 2004. Figure 1 shows an overview map of the three ORS sites. In the following tables of deployments, all times are in UTC. The time of deployment is the time the anchor was dropped. It takes about 5 hours for the anchor to fall to the sea floor and the mooring to settle out. The recovery time, unless otherwise noted, is the time the acoustic release separated from the anchor to start recovery. In the case of a mooring failure, recovery time is the time that the surface buoy began to drift away from the anchored site. 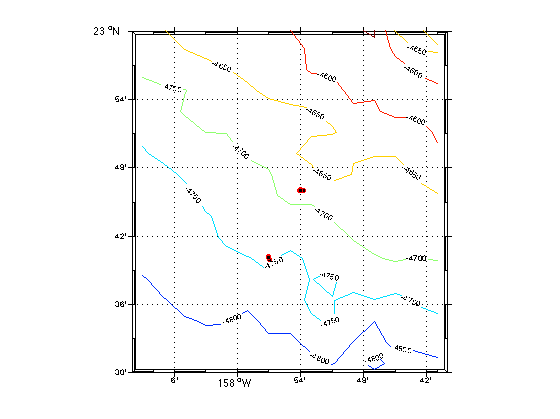 The positions are the surveyed anchor location; the watch circles are between 3.5 and 4.7 nautical miles, giving the positions an uncertainty of up to 2.5 nm. Figure 1. 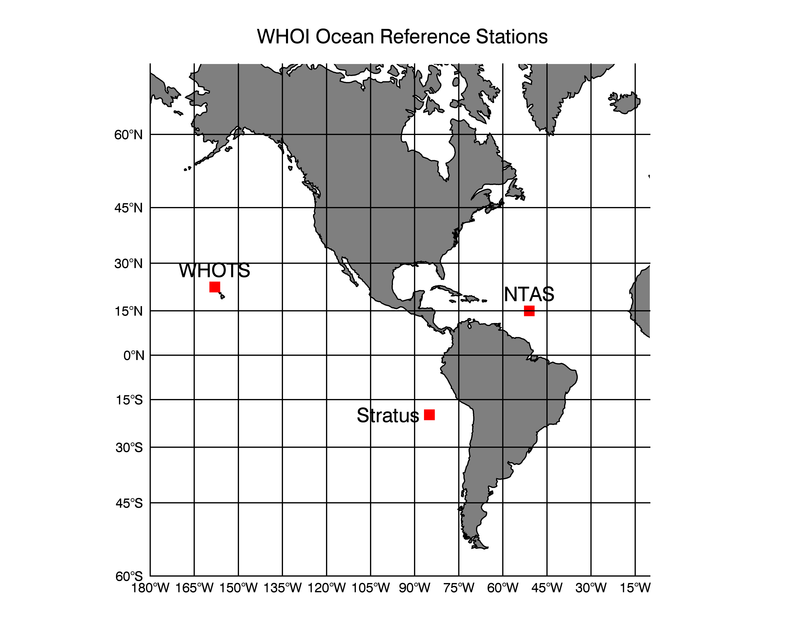 Overview map of the location of the three Ocean Reference Stations. Figure 2. 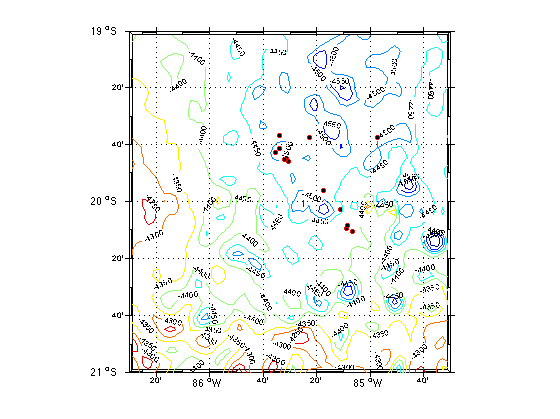 Stratus anchor locations for deployments 1 through 13 plotted showing the bathymetry in meters. The Stratus anchor site has been moved between deployments in an effort to reduce the data loss associated with damage to instruments from entanglement with fishing gear. Alternate position are also chosen each year to allow the new mooring to be deployed while the old mooring is in the water, thus providing overlapping periods of data collection to support data quality control analyses. Figure 3. NTAS anchor locations given by the red dots. Depth contours are in meters. NTAS typically alternates between two locations. The new mooring is deployed while the old mooring remains in the water, allowing collection of one or more days of overlapping data to support data quality control analyses. Figure 4. WHOTS anchor locations for deployments 1 through 11. Two alternating sites are used, allowing a new mooring to be deployed while the old mooring remains in the water. The overlapping data support quality control analyses.